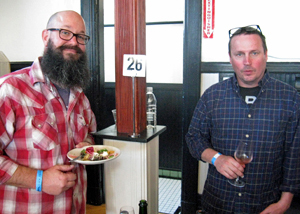 Report on the Second Brumaire Grand Tasting, held on Sunday March 12th, 2017, at Starline Social Club in Oakland. 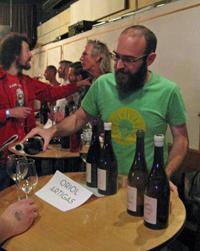 The event showcased natural wines, mostly from the United States and Europe. 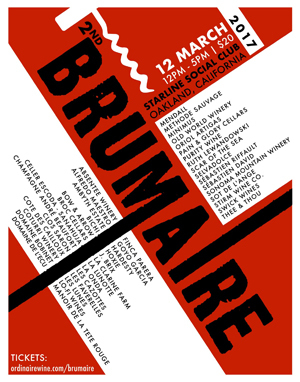 The Brumaire event is organized by two wine shops, Ordinaire in Oakland and Domaine LA in Los Angeles. In addition to the Grand Tasting, the event this year included over 15 smaller tastings and dinners with producers at wine shops, wine bars, and restaurants in San Francisco, the East Bay, and Los Angeles. 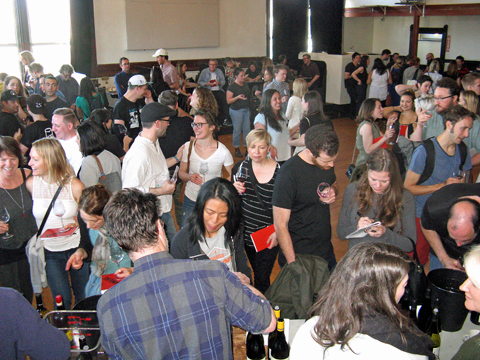 This was one of the largest showings of natural wines to date on the West Coast. As enticing as the Grand Tasting was already, the cost to attendees of only $25 – unheard of these days for a wine tasting event such as this one – meant that tickets sold out well in advance. Once again this year, the event organizers did a fine job of attracting a good cross-section of producers to Brumaire, and in most cases the winemaker was behind the table for the tasting. There were 44 wineries pouring this year, over double the number from last year’s inaugural tasting. Nearly half of the wineries were from California, plus eleven from France (many of them from the Loire Valley), six from Spain (mostly Catalonia), three from Oregon, and one each from Italy, Mexico, and Utah. 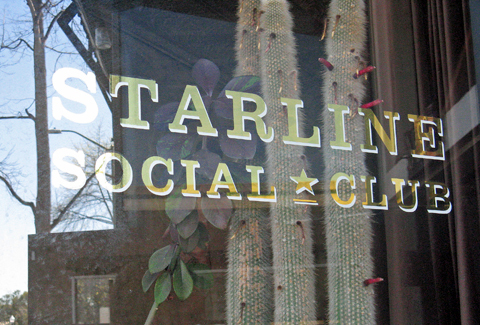 The Starline Social Club once again proved to be a fine venue for the event. With so many more wineries on hand this year, a number of them poured in a smaller downstairs room while most were in the main upstairs space. A nice upgrade over last year’s event was the bigger tasting booklet, which included not only a list of the wines to be poured but also a brief but informative description of each producer. Although there is no strict definition of what constitutes “natural” wine, there were a few basic requirements for the wines poured for Brumaire. Farming of the vines had to be organic at minimum – essentially limited to organic and biodynamic farming, though not necessarily certified as such. It was also required that all wines have no additions – generally understood to include yeast, malolactic bacteria, acid, water, enzymes, nutrients, etc. – except for sulfites. These criteria are fairly standard for natural wines, as well as for a growing number of smaller “minimal intervention” producers who are not usually grouped into the natural category. 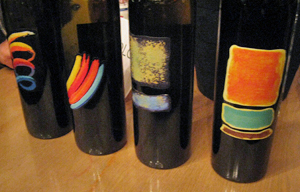 What set the wines presented at Brumaire apart – even from many other natural wines – was the tight limit of total SO2 in the wines, 20ppm for reds and 30ppm for whites. These are very low numbers, so the wines at Brumaire went beyond many natural wines on the market in having very little or no added SO2. With so many producers pouring this year, it was not possible to taste at all of the tables, but I did make it to nearly 30 of them. There were a handful of others I would have liked to check out, but there wasn’t quite enough time to taste their wines on this occasion. I tried to get a sampling from wineries I was already familiar with as well as those that were new to me. In the interest of time, I didn’t taste every wine at every table I visited, but I felt that I got a fairly good sense of each producer’s offerings and style. Many of the wines poured at Brumaire underwent relatively short aging prior to bottling, so a large percentage of them were from the 2015 and 2016 vintages. And with so little SO2 in these wines, most of them may be best consumed sooner rather than later although there certainly will be exceptions to that. 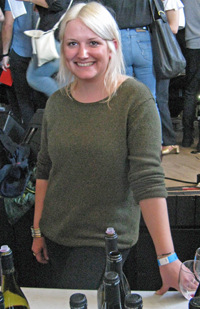 I found something to like at nearly all of the producers’ tables that I visited – there were plenty of highlights and fewer wines than last year that I felt were marred by unpleasant levels of brettanomyces or other issues. There were a lot of producers whose wines I particularly liked at this year’s tasting, including Bow & Arrow, Clos Saron, Domaine Dubost, Lo-Fi Wines, Pain & Glory Cellars, Oriol Artigas, Ruth Lewandowski, Selvadolce, and Sot de l’Ange, with several more close behind this group. I should note that six of the nine producers above were entirely new to me at this tasting, and it’s unusual – and exciting – to discover so many good wineries at one event. I have to admit that I was a little underwhelmed by the wines at last year’s inaugural Brumaire tasting. It was a fun event, and there were a number of standouts but also quite a few wines that just didn’t show very well, at least to me on that day. But what a difference a year makes! I thought the overall quality of the wines I tasted was significantly up over last year. Along with a great diversity of styles on display, there was more consistency in quality across the board. Making good wine with little to no sulfur is not easy, and these wines were truly a testament to the skill of the vintners who poured at Brumaire this year. These wines are still a small niche market in the overall wine world, but they certainly have their place. If you haven’t checked them out yet, this seems like a great time to do it, particularly as many of these wines are not that expensive. I really enjoyed the many distinctive wines at the Second Brumaire, and I’m excited about returning again next year. Baja California’s Bichi label was one of the finds for me at last year’s Brumaire tasting, and though I didn’t find as many of their wines to my liking this time, I did think their floral, spicy, and earthy 2015 Tempranillo was noteworthy. This was my first experience with Scott Frank’s Bow & Arrow wines, and they turned out to be one of my favorite producers at the tasting. An urban winery based in Portland, the wines are inspired by those of the Loire Valley. Both of their white wines were highlights – the 2015 Melon, with bright pear and apple notes, and the 2015 Sauvignon Blanc, with floral and herbal citrus aromas and a crisp finish. Also very good was the herbal and earthy 2015 “Air Guitar” (60% Cabernet Sauvignon, 40% Cabernet Franc). Berkeley’s Broc Cellars poured a couple of standout wines. The 2016 Sparkling Chenin Blanc featured bright, earthy pear fruit and a slightly sweet finish, while the 2012 Mourvèdre, from Luna Matta Vineyard, was meaty, smoky, and finished with a stony mineral note. Celler Escoda-Sanahuja made its second appearance at Brumaire, and their 2013 “La Llopetera” was the highlight of their line-up this year. This wine is a Pinot Noir – from the winery’s base in Catalonia – and had raspberry notes along with spice and earth overtones. From California’s northern Sierra Foothills, Clos Saron poured a strong wine line-up. Standouts were the 2015 “Carte Blanche” blend of Albariño and Verdelho, with floral and pear aromas and fine acidity, and the 2013 “Stone Soup” Syrah (co-fermented with about 10% Viognier), with dark fruit, herbs, and floral notes plus youthful tannins. Two wines from 1998 that vintner Gideon Bienstock had on hand were a nice bonus – the earthy 1998 “Once Upon A Time” Pinot Noir and still youthful 1998 “Black Pearl” Syrah-based blend. Domaine Bobinet comes from Saumur in the Loire Valley, with a focus on Chenin Blanc and Cabernet Franc. My favorite of their wines at the tasting was the 2015 “Les Gruches”, a Chenin Blanc that had earthy pear and stone fruit aromas with undertones of spice. Being from Beaujolais, it’s no surprise that Domaine Dubost works with Gamay fruit. This was my first time trying their wines, and all three that I tasted were standouts. The 2015 Brouilly Cuvée de Vielles Vignes comes from 80 year-old vines, and featured beautiful floral aromas, red fruit, and vibrant acidity. The 2014 Fleury had an earthier profile, along with black cherry and spice, with a lively texture. The 2015 Moulin-à-Vent displayed great purity of cherry fruit, with undertones of flowers, herbs, and earth, and a juicy acidity on the palate. Strong wines across the board. From the Penedès region of Catalonia, this was Finca Parera’s debut appearance at Brumaire. I thought the highlight of their wines was the 2014 “Sassó”, made from 100% Xarel·lo, a Catalan grape mostly grown for use in Cava. Aged in acacia barrels, the “Sassó” displayed fresh pear and stone fruit aromas, earth, and a touch of spice. J. Brix is one of a handful of producers helping to make a name for wine from San Diego County fruit. I thought the standout of their line-up was the 2015 “Rougarou” Carignan from 38 year-old vines at McCormick Ranch in San Diego County – dark fruit, earth, spice, and good structure. Their 2016 “Coloborum” Pét-Nat Riesling from Santa Barbara County’s Kick-On Ranch was nice as well. From El Dorado County in the Sierra Foothills, La Clarine Farm produces a number of distinctive varietals and blends from fruit grown in their area. My favorite was their 2015 Syrah from Sumu Kaw Vineyard, with pure dark berry fruit along with notes of flowers, herbs, earth, and black olives. Also nice was the earthy, spicy 2015 “Piedi Grandi” blend of Nebbiolo and Mourvèdre, also from Sumu Kaw. La Lunotte is located in the Touraine region of the Loire Valley. They poured two wines at Brumaire, and the standout was their 2014 “La Bulotte”, a Pét-Nat Cabernet Franc. Lightly sparkling, this featured pure red fruits with hints of flowers and stony minerals, with fine acidity – very tasty. Dani Rozman of La Onda sources much of his fruit from the northern Sierra Foothills, but I thought the highlight of his wines was one made with fruit from the Maule Valley of Chile. The 2015 Cinsault/Pais comes from old vines, with about 70% Cinsault and 30% Pais (known in California as Mission). With earthy red fruit, spice and a savory component, this was a very distinctive wine. Lo-Fi hails from Santa Barbara County, and much of their fruit comes from that area. Their 2016 Pét-Nat Rosé (from Mourvèdre) had 12 hours of skin contact for the fruit prior to pressing – quite pleasant, lightly sparkling with fresh berry and earth aromas. Another highlight was the 2014 Cinsault from Demetria Vineyard, with bright, savory red fruit and fine acidity. The 2015 Gamay/Pinot Noir (90% Gamay) and 2015 Cabernet Franc – both made using partial carbonic fermentation – were also winners, the Gamay/Pinot with earth, cherry, and herb notes, and the Cab Franc with a more fruit-forward herbal profile and a grippier finish. Nice wines across the board for Lo-Fi, one of the best showings of the day. From Saumur in the Loire Valley, Manoir de la Tête Rouge focuses on wines from Chenin Blanc, Pineau d’Aunis, and Cabernet Franc. Their 2015 “K Sa Tête”, from Pineau d’Aunis, was a standout, with earth, black cherry and plum, and herbs, with juicy acidity. The 2014 “Tête de Lard”, from Cab Franc, was also good – more upfront fruit plus herbs and black pepper. From the Terra Alta region of Catalonia, Mendall poured their wines for the second time at Brumaire. My favorite this year was the 2015 “BB” – the wine name comes from Bernatxa Blanc, Catalan for Garnacha Blanca. Earthy and spicy with pear and citrus aromas with medium body and a lively finish. Chad Hinds’ Methode Sauvage label specializes in Chenin Blanc and Cabernet Franc, sourced from various northern and central California sites. A couple of the wines were highlights at the tasting. The 2016 Chenin Blanc, from Vista Verde Vineyard in San Benito County, displayed earth, pear and stone fruit, with a hint of wet stones and vibrant acidity on the palate. The 2015 Cabernet Franc, from Bates Ranch in the Santa Cruz Mountains, had upfront herbs with red and black fruit, a touch of black pepper, great structure, and fine tannins. Catalonia’s Oriol Artigas was one of the finds of the day for me. The 2015 Mas Pellisser Vi Blanc, made from Godello and Xarel·lo grapes, had bright citrus aromas with earth and stony mineral notes, while the 2015 La Rumbera is mostly from the Pansa Blanca grape variety, and featured more body and spice, but retained the minerally quality. From older vines with three days on the skins before pressing, the 2015 Peça d’en Blanch Blanco (75% Pansa Blanca and 25% Pansa Rosada) had a deeper color with pear, earth, and savory herb notes. The 2015 Peça d’en Blanch Negra is mostly from Garnacha, with bright red fruit, herbs, and earth, in a lighter style. Terrific wines all around from Oriol Artigas. Many people have been eagerly awaiting the first releases from Chris Scanlan’s Pain & Glory label. It sounds like the initial release will come this spring, and judging from the development of several of these wines since last year’s tasting, it will have been worth the wait. Both sourced from Demetria Vineyard, the 2013 “Hüginn & Müninn” (90% Syrah and 10% Viognier) and 2013 “The Wyrd” (Grenache and Mourvèdre plus 3% Roussanne) were good last year and have taken a step up this year, particularly the floral, savory, and minerally “Hüginn & Müninn”. A barrel sample of 2015 Chenin Blanc, fermented on the skins, showed good potential as well. Noel Diaz makes his Purity Wines on Treasure Island in San Francisco Bay, but much of his fruit comes from the northern Sierra Foothills. His pre-release 2016 Mourvèdre Rosé was a standout, with pretty floral aromas plus red fruit and earth notes and a clean finish. The 2015 Syrah (with a little Carignane) was also promising. Evan Lewandowski sources his fruit from Mendocino County, though his base of operations is in Salt Lake City. He poured several noteworthy wines at Brumaire. The 2015 “Naomi” is Grenache Gris from Gibson Ranch – nearly clear in appearance, with fresh pear and stone fruit character, while the Carignane-based 2015 “Boaz” blend, from Testa Vineyard, showed berry and earth notes with bright acidity. The 2015 “Chillon” – Cortese from Fox Hill Vineyard – spent six months on the skins and featured an intriguing spicy and slightly cheesy phenolic character. Selvadolce, from Liguria, was the sole Italian representative at this year’s Brumaire tasting, and they poured a strong line-up, featuring wines from Vermentino and Pigato (which may be a distinct clone of Vermentino). The pear, saline, and stony aromas of the 2015 “Crescendo” Pigato were quite distinctive, while the 2012 “Rucantu” Pigato, from older vines, showed a mildly petrol character along with the stony mineral quality. A barrel sample of 2015 “VB1” Vermentino, pressed after three weeks on the skins, was promising, with fresh pear and spice notes. This was my first experience with the Selvadolce wines, and I was impressed. Sot de l’Ange is based in Azay-le-Rideau in the Loire Valley. This was the first time I tasted their wines, which were strong across the board. Two whites from Chenin Blanc were highlights – the 2015 “Sec Symbole” featured fresh and juicy apple and citrus flavors, while the 2015 “Le Goujonnière” had floral and earthy notes with bright citrus fruit. The 2013 “Rouge G”, a blend of Grolleau and Gamay, combined cranberry fruit with a stony mineral character and vibrant acidity. Stirm’s Rieslings were very good at last year’s tasting and the same was true this year. My favorite was the 2015 “Eloian” Riesling sourced from Kick-On Ranch – with about 24 hours on the skins and made entirely in stainless steel, this displayed bright citrus aromas with a floral touch, plus stony mineral and petrol notes. Also of interest was the 2016 “Los Chuchaquis” Rosé from Enz Vineyard – from Mission, Mataro, Carignane, Zinfandel, and other varieties, this was earthy with bright red fruit and juicy acidity. Swick, based in the Willamette Valley, was a new producer to me. The floral 2016 Verdelho and more phenolic 2016 Grenache Blanc (spent one month on the skins) were both nice, but the 2015 “Hibernation” Pinot Noir from Cancilla Vineyard was my favorite of the Swick wines – made entirely in concrete, this had earthy, smoky black cherry aromas with herbal undertones. John Donaghue’s Thee & Thou wines are made on Treasure Island in San Francisco Bay. His pre-release 2016 Albariño showed promise, while the 2014 “Thee & Thou” Syrah/Grenache blend from Demetria Vineyard was the standout of the reds, with dark fruit, herbs, earth, and a stony mineral note.